Camping has always been popular, but as the modern world becomes more sophisticated and desiring of luxury, the popularity of mobile homes over tents has risen accordingly. 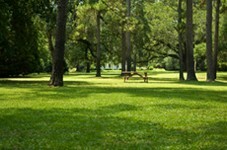 Wherever you go in France, you will find campsites and mobile home sites, often combining the two within one location. Some are designed for holidays, others provide for permanent or long-term living. These sites can vary massively in every possible way, with some being huge and equipped with every conceivable convenience and leisure facility, while others have very little to offer but peace and quiet, basic facilities and pretty surroundings. Whichever type of site you are seeking, however, you are bound to find one to suit your needs. France loves camping in any form, and it seems that mobile homes are not only the new way to camp, but also, for some, the new way to live. French mobile homes - how mobile are they? It is important to understand that the term "mobile home" often refers not to a touring caravan, which you move around with you, but a static caravan that occupies a permanent or near permanent site. These mobile homes are so called because they can be moved, for example, from the manufacturers to the site, or to a different site when sold or required, but they should generally be considered as fixed. Mobile homes vary considerably in size and accommodation, but usually they are set out with separate rooms; a living room (normally with convertible sofas which can be pressed into service as extra beds if required), a kitchen area open to the living room, a bathroom and any number of bedrooms depending on the size of the mobile home. 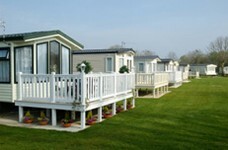 Many sites provide pitches which include fenced private garden areas and decking areas for al fresco dining and appeal. Mod cons may be included, with dishwashers, washing machines, televisions and other luxuries found in many homes. When choosing a mobile home, whether for a holiday rental or to buy, be sure to ask what sort of facilities it already has. It may be possible to purchase extras and have them fitted if you are buying a new mobile home direct from the manufacturers. Once again, it is difficult to generalise, as the sites can vary a great deal. Different types of site will please different types of people, with some enjoying the tranquillity and feeling of being at one with nature found on small rural sites, while others will prefer the big sites with extensive facilities. A small site may offer very little other than a pitch with utilities connected, which may not really be a problem as everything you need, including washing machines and other conveniences can be found within the mobile home. A large site may offer swimming pools, tennis courts, bars and restaurants, laundry services, babysitting services, children's clubs and entertainment. Some even have discos and take away pizzas available for residents and holiday makers. A mobile home can make a perfect base for a holiday. They are ideal for families with young children, who may be uncomfortable with the restrictions of hotel life, or who might worry, for example, that noisy children or a crying baby could disturb other guests. A mobile home provides more privacy and an easier way of living, allowing you to decide when and what you eat, to arrive back at your holiday base at any time you choose, has more outside space than a hotel balcony and gives a sense of being a real home from home. There are a great number of holiday companies as well as individuals who offer mobile homes for rent in France. Some of the best known firms are the big "campsite" holiday companies such as French Life, Eurocamp, Keycamp, Roan, Selectacamp and Suncamp, although a very brief internet search or glance at the holiday pages of a newspaper will show that there are many more besides. There are also privately owned campsites that are not part of these large chains, and it is also possible to rent a mobile home direct from the owner. The small ads of the local paper are a good way to find these, but word of mouth from someone who has had a successful holiday is always best! The big companies have the advantage of years of experience, and usually provide the most extensive facilities. The downside to these sites can be that in search of maximum profit, such companies may provide smaller pitches with neighbours a little too close for comfort and parking areas that require expert reversing techniques to fit into! Check also when booking that your mobile home is not sited right beside the toilet blocks, the disco or the main road through the site, as all of these positions can be noisy and spoil the holiday. French mobile home holidays - are they expensive? A holiday in a rented mobile home can be a cost effective way of holidaying in France, but remember prices vary massively from area to area. Expect popular locations such as the Riviera (French Riviera Property - an insider's guide) and Brittany (Brittany Property Guide) to be more expensive and to be booked up quickly. They also vary from site to site and according to the size and quality of the home and its fixtures and fittings. Prices from the large companies vary from as little as £150.00 for a two-bedroom home for a family of four for seven nights in April, or as high as €1,500 for the same family in a more luxurious home on the Riviera in August. To get a good deal you need to shop around, comparing prices and accommodation offered carefully, especially if work or school commitments mean that you need to take your holiday at the peak times. Mobile home holidays in France - what is included? It is very important to ascertain exactly what will be included in the holiday package, as often you will need to make arrangements with the holiday company to hire necessities such as bed linen and duvets, or to bring these with you from home. Others may provide these things as standard. If you are hiring privately you should be able to arrange terms to suit with the owner, regarding such matters as linen and cleaning. Be aware that while the big holiday companies will have a team of cleaners on hand to make the home ready for the next holidaymakers at the end of your stay, a private owner may not, and you may be expected to do the laundry, clean the home and prepare it yourself. It may be that you are considering purchasing a mobile home to use for frequent holidays. There are several ways of doing this. You can buy direct from the manufacturer, purchase or rent a pitch on a site and have the mobile home transported to your chosen site. Prices for new mobile homes (not including transport) begin around £13,000 for a basic two-bedroom model. If this is too expensive, you could save a considerable amount of money by purchasing an ex-rental home. Chances are that you may have to also have this transported from the company who sell it to you, but they often offer deals which make the transport more reasonable. Expect to pay anything upwards of £3,000 plus transport. Finally, you could buy a home that is already on site, either from the holiday company or site owner or from a private seller. Again, prices will vary according to the size and quality of the home, the pitch and the site, but you will benefit from not having to pay any transport costs. French mobile homes for sale - are there any extra costs or disadvantages? If you own a mobile home on a holiday site you will have to make certain extra payments, as you would if you owned an apartment in a holiday complex. Every site will charge an annual fee for the pitch rental, which should be in the region of £2,000 to £4,000. Smaller campsites with less facilities may charge less, so if your budget is tight consider these costs carefully. These charges should include necessities such as the collection and disposal of your rubbish, adequate lighting around the campsite, sewage, grounds maintenance and use of facilities such as swimming pools, children's parks and similar amenities. Obviously you will also need to budget for utilities (gas, electricity etc) and insurance, which is a legal requirement in France. When are mobile home sites in France open? It is also important to check that your park or campsite will be open at the times of year that you are likely to want to visit it. Not all sites are open all year round, although these days many will be. Pitch rentals could be cheaper in sites which only open in summer, but only you can decide which option is more suitable for you. You should also carefully consider whether or not you may be frustrated by always having to take your holidays in the same place, or whether the familiarity of returning to a place you enjoy is actually a plus point for you. Mobile homes in France - are they a good idea? Renting a mobile home can be a great idea for budget conscious holidaymakers, with all home comforts and often excellent facilities as well as a built in social life. The purchase of a mobile home can also be ideal for many, providing years of relatively inexpensive holidays, a home from home with friendships built up with other owners, and the easy life that comes from knowing an area really well. As an investment, a mobile home clearly doesn't score as highly as bricks and mortar because the value will actually decrease over time, whereas a traditional "fixed" property will usually increase in value (except in exceptional circumstances). But the prices are lower and the rentability factor high enough to realistically cover costs, as long as you have a decent pitch on an attractive site. I have just read your interesting article on your website and would love to know more about permanent living on a mobile home park. I am presently living in Switzerland, but seriously considering a move to France (Southern regions) for my retirement. A mobile home sounds like a perfect solution, but I'm still not too sure as to whether I can remain on any park all year round, although I do understand that I would be requested to provide a so-called "permanent" address, whether in Switzerland or England. Many thanks for any information or advice that you may be able to offer. Thanks for contacting us. I understand it is indeed possible to live all year on certain mobile home sites in France, but it depends on the site as some allow this and some don't, so you would have to check with each site you might be interested in. As the owner of a mobile home in the Var I would be very interested in any information you might be able to give me regarding gaining a list of sites elsewhere in France should I wish to transfer my mobile. These could be either rental based or purchase/leasehold sites. Can you help? Thanks for contacting us. I'm afraid I don't know of any one place where you can obtain a list of mobile home sites in France, though as we have mentioned in our article, you may like to check with some of the holiday companies such as French Life, Eurocamp, Keycamp, Roan, Selectacamp and Suncamp, to see what they have to offer people with their own mobile homes. There are also privately owned campsites that are not part of these large chains. The small ads of the local paper are a good way to find these, but word of mouth is always best. Then it is a matter of searching the internet, using Pages Jaunes or perhaps using the Total France forum. My husband and I own a mobile home in a leisure site in France. We would like to move it and relocate to a different site but have been told that we will be liable to pay 7,000 Euros in tax wherever we move it to, as well as removal fees. Can you tell me what this tax is please? Thanks for contacting us, though I am afraid I have no idea what this tax might relate to. I would question this with whoever is demanding the tax, or contact a property tax expert, or even your Mairie might be able to help. I have a friend who owns a mobile home in France. He has rented the site on a yearly contract for the past twelve years. He wants to terminate the contract but the landlord insists he pay a year's rent and the cost of removing the mobile from the site. What is the law in Alpes-Maritimes? Thanks for contacting us. Though I am afraid I cannot help much, other than suggest your friend contacts his Mairie, or a legal advisor about this. I am assuming there was nothing in the agreement your friend signed when first renting the site, about such fees. Hello - I have a mobile home on a residential holiday site in France, Mayenne area. We are charged TVA at 19% on the ground rental. We are looking at moving to another site in Brittany and on their agreement the TVA is much lower at 5%. We are now thinking that we may have been overcharged for the last five years. Can you clarify please. Thank you. I bought a mobile home seven years ago in the south of France. I pay 3600.00 Euros per annum for ground rent on a family French owned site. We have to sign a yearly contract and the last three years have been told that if we sub-let to anyone other than direct family we will be charged 10 Euros per day. I have just received a bill for 790 Euros. I rent out for about about ten weeks a year if that to try and cover my costs. Is this legal of them? Thanks for contacting us. I would think it very much depends on what is in your contract. If you have agreed to this by signing a contract which states this rule, then I would think it is legal. You could always check with the Mairie, for confirmation. I own a mobile home on a rural campsite near Argeles sur Mer and would like to know what rights do I have as an owner. New campsite owner is moving mobile homes on the site without informing owners even though we have a fully paid contract on named site pitch. Help! Do I have any rights? Thanks for contacting us. I would suggest you could talk to the people at your Mairie and the Maire to see what rights you might have, as they should know what can and can't be done. I would think the new owner has to go by whatever contract was signed, when they purchased the site, but how you find out what was written in this contract, I am not sure. I would hope your existing contract would be valid, but situations may change on new ownership. Have you asked the new campsite owner about any new rules and regulations? Many thanks for your reply - it was very helpful. I haven't spoken to the new campsite owner yet as we are going down to France in two weeks' time. I will also take the opportunity to speak to the Maire. We bought a wooden holiday cabin on a privately owned site six years ago. The owner of the site has closed the site and cut off our water and electricity. He has broken his contract with us and we no longer pay him site fees, as he has closed the business. He wants to sell us the plot of land our holiday chalet is on but we are worried that if we buy the plot we may be liable for habitation tax and tax fonciere. Can anyone advise please. Thanks for contacting us. I think the best people to ask are those at your Mairie, as they should know all the rules regarding this. I would think though that you may well have to pay property taxes if you buy the land your chalet is on. My husband and I have a mobile home in France that needs updating. Could you give us information on how to organise this please? Where we could go to buy an updated caravan, and how we would arrange for it to be sited. We would be looking for a 3 bedroom but quite happy for it to be second hand if good condition. Thanks for contacting us. I would say the easiest way is to search the internet for mobile homes for sale in France. Numerous options came up when I did a quick search earlier. You could also join in forums and use Pages Jaunes. If you are in France, small ads of the local paper are a good way to find these, or you could ask at your Mairie and also check with appropriate holiday companies. I am looking for mobile home sites in France to make my place of residence full-time. I would like to be inland from Bordeaux. Can you offer any advice please? Thanks for contacting us. If you are wanting to live in a mobile home full-time, you will need to look for Parc Résidentiel de Loisirs (PRLs) or residential parks. The internet is probably your best bet to search for these, though you could also look at local papers and check with Mairies if you are in France. I own a small 3-star campsite in the Limousin which I am gradually converting to a PRL (Parc Residentiel de loisirs) and have around ten pitches left for rent, for installing a mobile home or chalet. The law in France prohibits anyone from using a mobile home on a campsite as a principal address so, in theory, full-time living without having a principal address elsewhere is prohibited by law. I say in theory because there are thousands of people living in a mobile home or caravan on French campsites all year and use the campsite as a principal address, as have four people on my campsite for a number of years. The four people on my site are registered to vote at the local Mairie and the authorities turn a blind eye to this situation, as long as there are no problems caused by these people. There is talk about a new law being proposed which will make owners, using their mobile home as a permanent residence, liable to pay the Taxe d'habitation instead of the current tourist tax which they must pay. However, this would entail a huge shift in the law and effectively allow people to choose this method of permanent living legally. Naturally, the government wants to reflect on this so it's just a proposal at the moment, but the situation will change at some time in the near future because with the economic crisis in full swing, house prices still high and banks not lending, this idea represents a good, relatively cheap, alternative to having a permanent residence. I hope that this helps, but I can be contacted on lesvigeres@aol.com for further information if necessary.